One of the many product lines HO Collector is researching and seeking additional materials is Campbell Scale Models. The company has been producing craftsman-level kits for more than half a century. 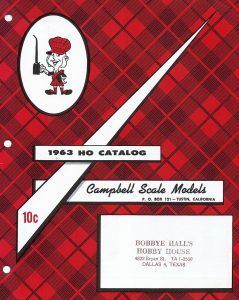 Here’s a sampling of what you’ll find in Campbell Scale Models’ 1963 HO Catalog. The company launched in 1960 and this 1963 catalog gives you a look at what was offered during its early days. The six-page publication provided a two-color cover with the interior presenting informative text and detailed black & white images of products offered. 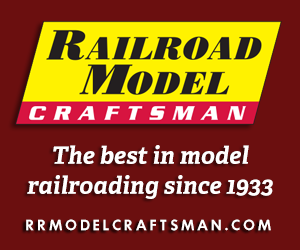 The catalog includes four wood trestle kits carrying 300-series stock numbers and priced from $1.75 to $3.95. 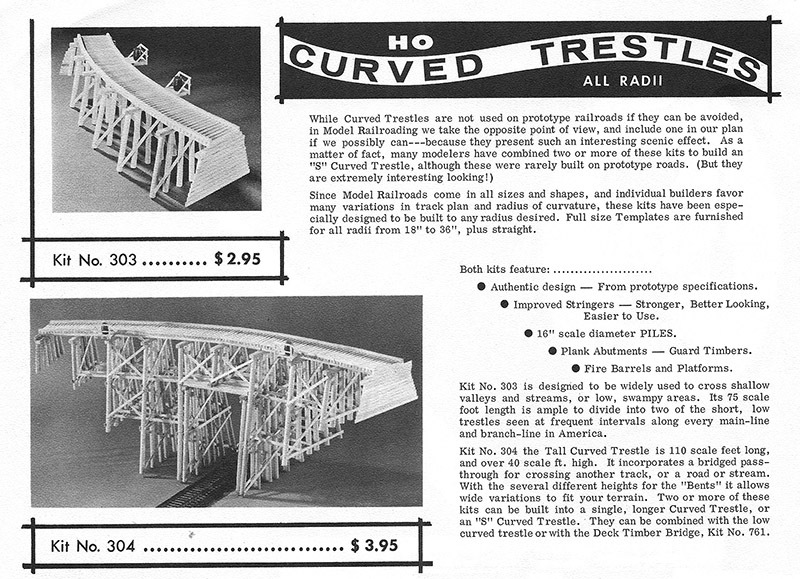 Campbell Scale Models promotes its curved trestle kits as being “ALL RAD!” and indeed they do look very intricate and impressive. In addition to the 300-series trestles, Campbell Scale Models includes a Timber Trestle (no. 751) that sold for $3.75. This kit’s description includes reference to it being a former Ayres Scale Models release. Bridges occupying Campbell Scale Models’ 760-series, include a Deck Timber Bridge and Thru Timber Bridge sold as “Old Time Bridges.” Campbell’s four other bridge kits reside in a “Modern Brides” category and included single- and double track overhead truss kits and a pair of girder bridges. Those kits feature retails ranging from $2.95 to $5.65. 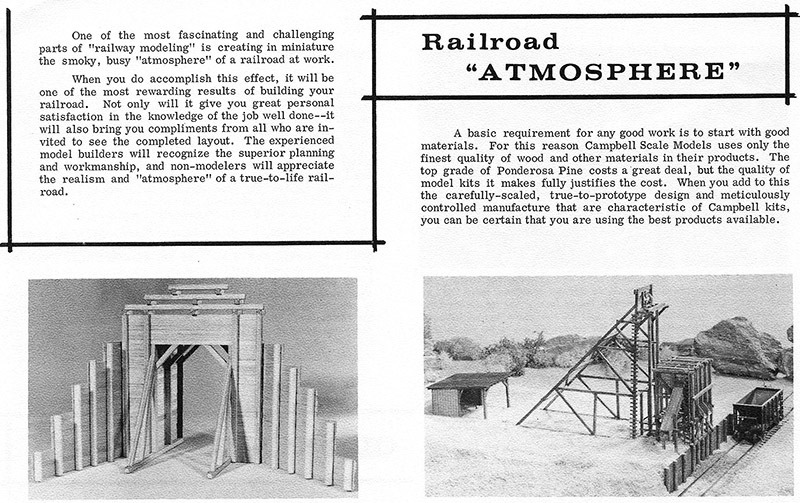 In the hobby manufacturer’s “Railroad Atmosphere” section, a Timber Tunnel Portal (no. 351) appears for $1.75, along with a Mine Head Frame (no. 352) selling for $3.95. The catalog includes three kits sold as “Trackside Stuff.” Those offerings present a Cattle Loading Pen (no. 781), Freight Platforms (no. 781), and Passenger Platforms. 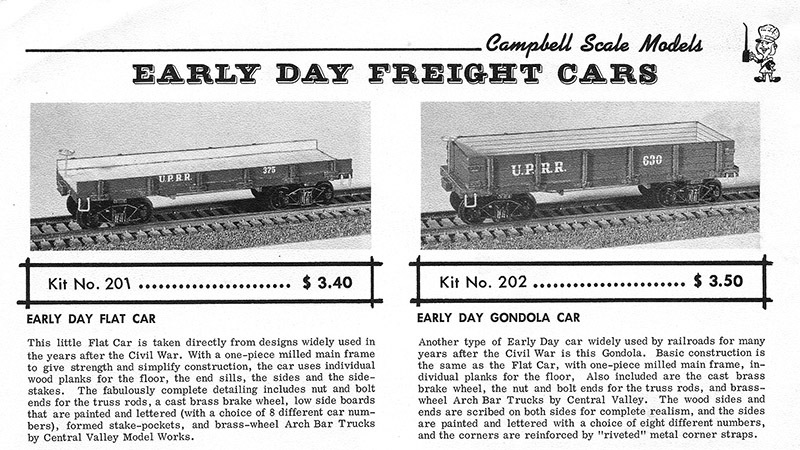 A pair of HO-scale freight car kits round out this early 1960s Campbell Scale Models catalog. Sold as “Early Day Freight Cars,” the kits represent prototypes from the U.S. Civil War era. A flatcar (no. 201) and gondola (no. 202) made up the 1963 Early Day kit offerings. The kits came with wood components, with brass brake wheel, metal stirrup steps, and Arch Bar-style trucks made by Central Valley Model Works. This vintage catalog shows the stamp of the one of the most famous hobby shops in the U.S. Located in Dallas, Texas, Bobbye Hall’s Hobby House was an institution and served hobbyists from just after the end of World War II the end of the 20th century. If you’d like to learn more about the lady behind this shop, who also imported brass replicas under the Hallmark Models name, be sure to look for her biography. 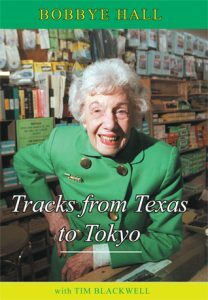 Published in 2006 by Ballpark Impressions, “Tracks from Texas to Tokyo” by Bobbye Hall with Tim Blackwell is a great memoir of one of the hobby’s greats. If you have trouble locating a copy of the book, a limited number are still available from the publisher. Find out more about Campbell Scale Models and see its current offerings by visiting the company’s website.